I think it’s safe to say… everybody wants more traffic. In fact, every time you hear about a new real estate agency crushing it online, I know exactly how you feel: envious, resentful … discouraged. Because over the last decade, the internet has become a universal part of the home buying process. As of 2015, a full 92% of all home buyers — across every geographic region and age range — use the internet during their search. What’s more, for 42% of those buyers, the internet is actually their very first step. Of course, you already know all that. how to generate enough online traffic to meet their lead generation needs. As a result, we often turn to paid traffic as an answer. But with the average cost of a single click for a location-specific phrase like “purchasing a home” sitting at $24 … paying for that life-sustaining traffic doesn’t come cheap. The good news is paid traffic — whether from Google AdWords or social media — doesn’t have to be the cornerstone of your online marketing strategy. Last year, of the 200,000+ leads our clients pulled in online, pay-per-click accounted for less than 20%. Eighty percent of our clients’ leads — roughly 160,000 from all over the nation — came from free and organic search. Through an approach we call conversation marketing. However, before we jump into our three-phase approach to generating more traffic and leads, let’s start with a few foundational principles. With a subtitle like that, you might think I’m advising against using paid advertising in total. There’s definitely a place for PPC and social media advertising to boost your website traffic fast, particularly when you avoid the common mistakes. But to generate traffic, leads, and revenue over the long term, you need to create content based on your target audience’s real needs and concerns. The difference between the two approaches comes down to separating your traffic-driving goals into two clear groups: (1) search-engine optimization (SEO) tactics to increase organic visitors — what we’ve termed conversation marketing — and (2) PPC tactics to increase paid visitors. Knowing the differences is vital. While it may sound technical, SEO really just comes down to creating search friendly content that your target audience will find helpful. We’ll get into the details of how to do this in just a minute. For now, it’s important to be aware that SEO takes a larger upfront investment of time and resources and its results don’t materialize overnight. Leads come to you. You don’t have to chase them down. Higher search ranking doesn’t just mean more traffic, it also means more trust. In turn, that trust turns a higher ratio of traffic into leads into deals. You’re not forced into competing for the same lead everyone else is after. Over time, lead cost dramatically decreases. Best of all, the more search-friendly, organic content you create, the easier generating traffic and leads becomes in the future. All of the benefits listed above come directly from an approach to online marketing known as content marketing. 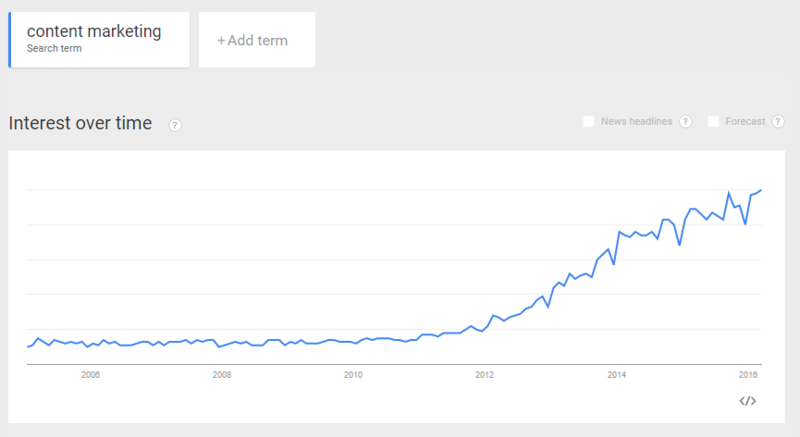 Since 2012, the phrase “content marketing” has exploded. Google Trends officially dubs it a “breakout,” meaning the number of global searches for the term has increased by over 5,000%. 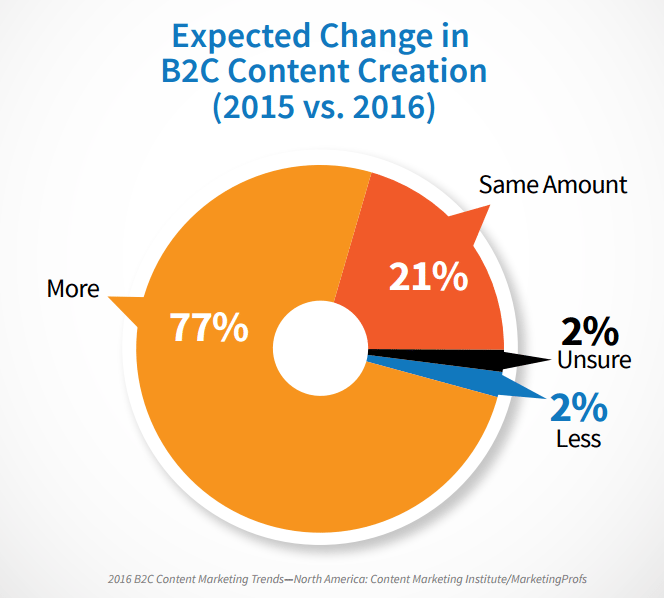 And it’s no accident that 77% of B2C marketers and 76% of B2B marketers to say that they’ll increase their content marketing efforts this year. The explosion of all things “content” is rooted in a simple principle: add value … and add it for free. 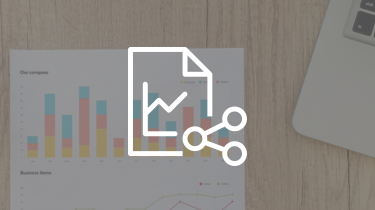 Whether it’s in the form of blog posts, buyer’s guides, checklists, podcasts, ebooks, webinars, or email campaigns, content marketing is the leading way to provide valuable information to your target audience and increase your traffic. 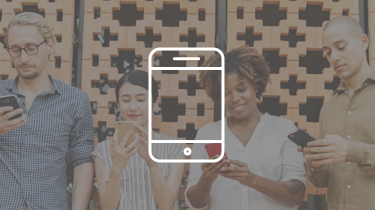 Because ultimately, all business — online or off — revolves around human connections. 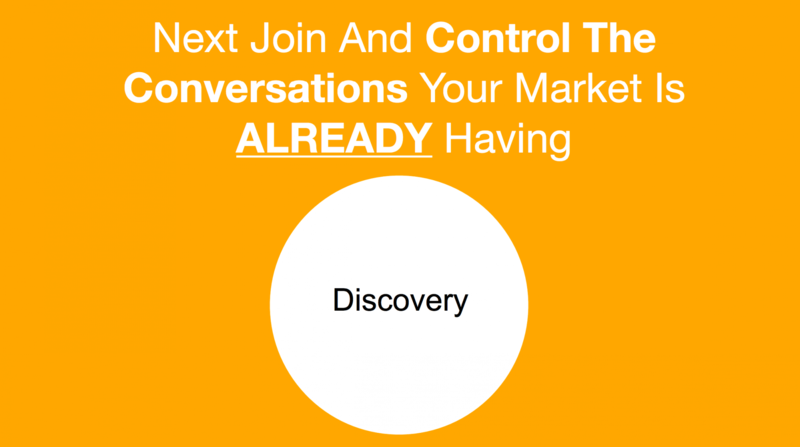 This is exactly why conversation marketing works so well. It educates and builds trust with your prospect. It gives them what they need to enter the real estate buying or selling process and complete their due diligence efforts before biting the bait. And best of all, it connects them directly to you as their go-to source for guidance. A full 81% of buyers say that most offline salespeople talk too much. And online, the same thing is true. In fact, most online marketing doesn’t just talk too much … they virtually shout. It’s easy to see why most consumers don’t want to engage. That means the key to starting a conversation is to listen. This sector [real estate] revolves around people and relationships, you can benefit by working with integrity. Trust and relationships are the most valuable assets in real estate whether you’re an investor or an agent. 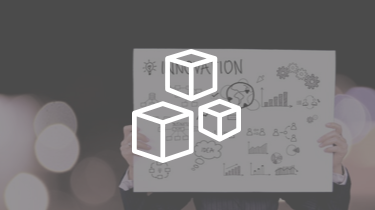 At InvestorCarrot, we use the term “Conversation Marketing” to define our approach to talking with both visitors and customers. Our primary aim is to talk “with” instead of taking “at”; meaning, the content we create avoids the more traditional marketing missteps of creating a one-sided conversation. This is especially important at the beginning. You’re in a busy restaurant. You overhear a conversation about someone trying to sell their house they just inherited and they weren’t sure if there were other ways to sell it besides working with an agent… they wanted it to get done quickly. Uh. Say what? Why are you butting into my conversation? “Hi Mike, it’s nice to meet you. Couldn’t help but overhear you’re thinking about selling a house you inherited. Tough process sometimes. I’ve been through that too. When did you inherit the house? Mike: Ah, it was my dads. He passed away last year but ownership was just passed to me this month and now I’m figuring out what to do next. Was thinking about renting it but I think I’d rather have less hassle and just sell. Scenario one is called interruption marketing. It doesn’t provide any human connection. It “butts in” rudely. While this would never be acceptable human behavior in the real world, sadly, it’s exactly how the vast majority of real estate website present themselves. Scenario two is conversation marketing. It’s engaging, focuses on listening, and builds itself on questions. Helps them solve a problem by delivering value and content. Over the years we’ve created and perfected a 3 part process to not just get a ranking or two… but really control the conversation around your marketplace in a big way. That’s how you dominate in SEO and content marketing. It’s basically 3 simple steps… and in this order. 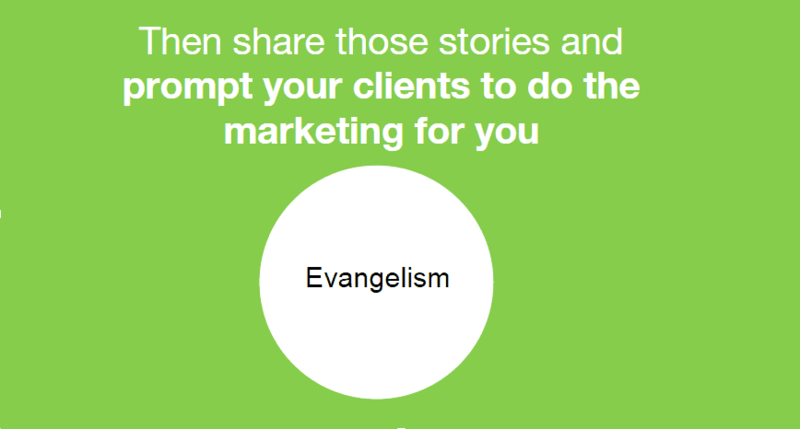 Create Evangelists – Helping your clients do your selling and content for you. Phase 1: Your Brand – What Are People Seeing? The first thing most people do when they make a big financial decision is hit the web to research the company they’re about to work with. So when you’re sending out your direct mail pieces, or doing PPC or SEO, or even your bandit signs… people are hitting the web searching for your business name or phone number to do some research on you. What do they see when they search your business name? Notice the suggested searches Google is giving me… people are actively typing those phrases in consistently, so you should create content that ranks well and controls the conversation around those keywords. Go ahead… Google your company name + your city and see what comes up. That’s what your prospects are seeing before they decide to work with you. Here’s what it looks like when you’re controlling the conversation around your brand vs. letting your competitors control it for you or the internet decide who you are to your prospects when they search you. Here’s a company that my consulting business works with that sells $600mm/yr in flooring and we helped them control the conversation around their brand in a big way. Notice The Videos We Created And 2 Articles That Are Ranked 1-3 For This Brand Related Search? Before, when you searched that phrase it was nothing but a few sites where those few negative nancy’s posted a bad review on their personal blog bashing the product. When in actuality on Home Depot.com the product rating was stellar and reviewed by tens of thousands of happy customers. Those couple bad apples raise to the top in Google. So we wrote down all of the keyword phrases that came up in Googles suggested search box around our company and created videos and articles optimized to rank well for each on. We teach you how to optimize your posts and videos to rank well in Google in our 3 Lead Per Day Training for Carrot members. [your main city]Type those into Google and see what comes up. Are you ranking well for any of the top 5 results? If not, you need to create content on your site that optimizes for that keyword. At Carrot, we automatically optimize your “About” page for your company name and location, so that’s done for you. 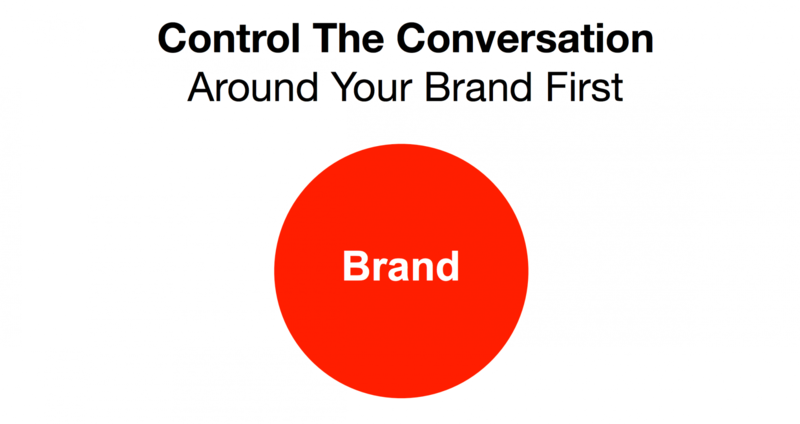 But to really control the conversation you may want to create more content. Create content and a video or two to rank for that content. Then launch it on your website and put it up on YouTube. Basically title the YouTube video the exact keyword phrase you’re going after. 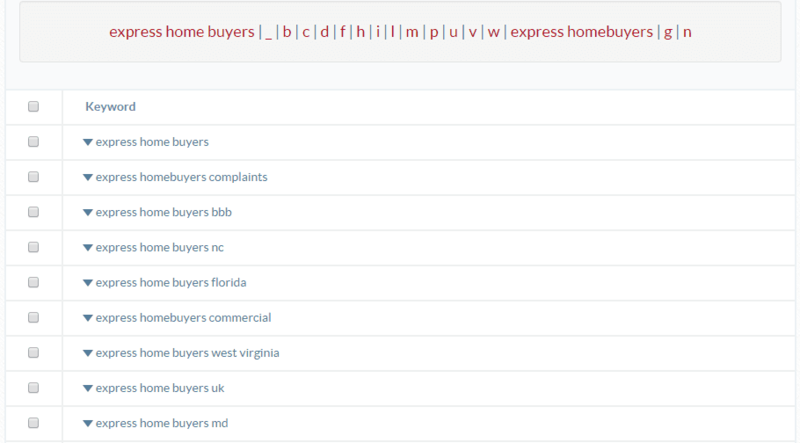 If you’re going after the keyword phrase “ABC House Buyers reviews” you should upload a testimonial video from a client of yours and name the video title that in YouTube. Easy eh? Then every month search the phrases around your company name and see where you stand. Even 1 lost deal because your client sees something online about you that makes them at all uneasy (including not finding anything about you at all) could cost you tens of thousands of dollars. Phase 2: Discovery – What Are People Searching To Solve Their Real Estate Problems? The best way to increase your traffic — without being forced to pay for it — is through content creation and getting that content ranked well in Google. That content will be the backbone of your conversations. This phase is joining the conversations and hopefully eventually controlling those online conversations as people are going online to “discover” the solutions to their problems and the answers to their questions. The need for content is universal online is because search engines like Google will only consider your website to be an authority if the content you create (1) revolves around the keywords your ideal customers are already using and (2) that content itself is valuable enough to be shared and linked to by sites and businesses other than your own. However, never forget the aim of conversation marketing: getting more visitors to your website by actually helping them. 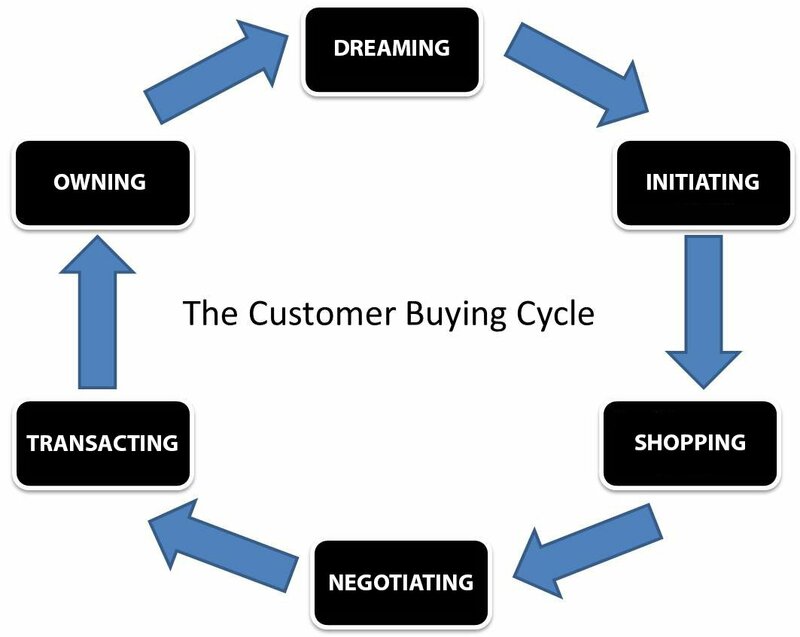 This is the earliest stage of the “buying” process when the prospect has an initial thought to buy or sell a property (or note, or land, etc.). The initial thought has dug in a little deeper and the prospect tentatively starts exploring online. 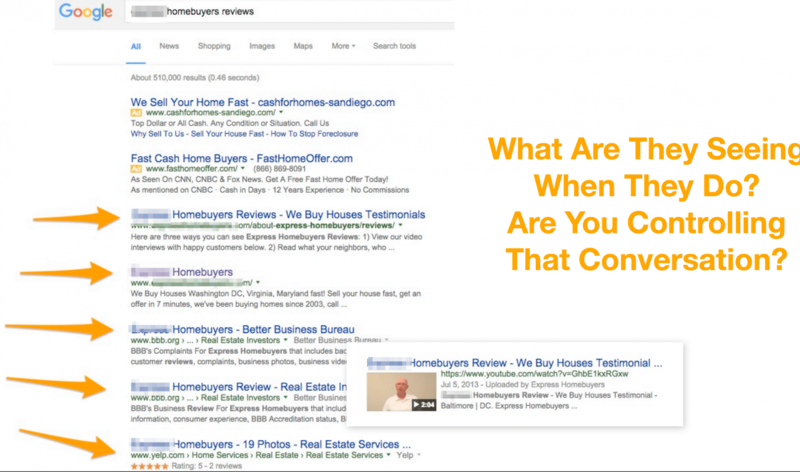 This is where your real estate investing business can address a need, by providing content using search terms the prospect uses to search for information. Like “How to sell a house I inherited in Dallas”. They’re starting that conversation online… will you engage with them or let your competitors? If you’ve already “nabbed” your prospect with value-add content in the first two phases and have their email address on your list, this is where you start reaping your rewards. Only when your company has helped educate and build trust with a prospect they are likely to turn to you when they’re ready to officially engage. Small and large businesses alike often make the fatal marketing mistake of trying to be all things to all people. Kind of like trying to cram everything on one site for house buyers, house sellers, renters… etc. 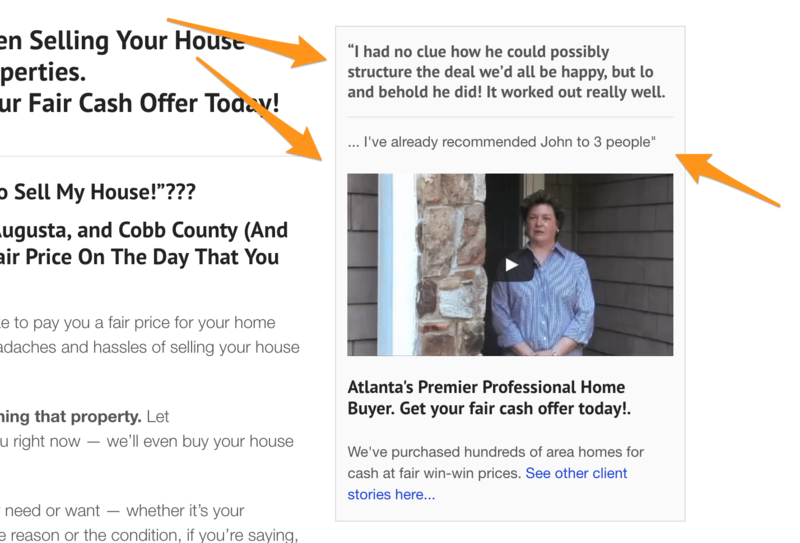 And you shouldn’t use the same site for motivated house sellers and cash buyers for your content either (like we teach here in this article). Instead, it’s vital to get focused on the handful of brand-defining specialties that make you stand out. Take Business Insider’s graphic These 10 Corporations Control Almost Everything You Buy as an example. 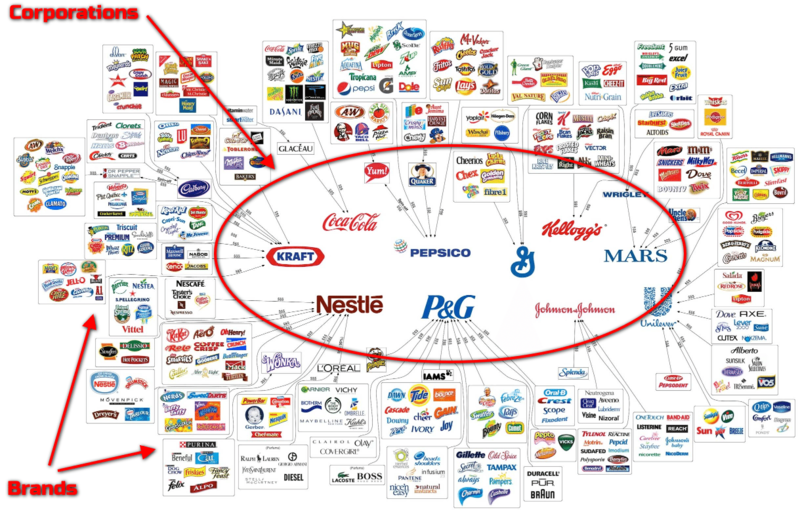 Notice that in the middle of the image are the 10 corporations that own most of the goods we buy. The point is obvious: while there are only about 10 corporations in the driver’s seat, each has created distinct brands to actually sell their various goods and services. Because if they didn’t separate their brands into specific niches, they’d struggle to market themselves effectively. Regardless of your size, the same principle is true for you as a real estate investor or agent. Who is someone going to pick if they’re trying to sell a house they inherited? … or the company that just says “We buy any house”? I know I’d probably pick the company that seems like it has a specialty in the situation I’m in. In other words … your audience. Thankfully, deciding who you want to reach and digging into what they like, love, and hate, doesn’t take divination, a crystal ball, or even brainstorming. There are a host of online tools that can help you get to know the people you want to reach. In addition to the usual suspects, Placester provides a detailed list of online resources to try out. The benefits of identifying a single-target market — e.g., “first time home buyers with less-than-perfect credit in the Portland area” — versus trying to be all things to all people — e.g., plain vanilla “home buyers” — are enormous. And this is true not only from a marketing point of view, but also from a service perspective. For instance, more and more people are turning to social media channels to share their home-buying experience and provide feedback, whether good or bad. What are their struggles, fears, and anxieties? What reasons motivated them to want to sell a property or buy one? What are their dreams and expectations? What is it that they’re really looking for in a house buying / selling service? What do people who’ve completed their first purchase or sold their house wish they’d known at the start? Again, the important thing with conversation marketing in the real estate investment and agent business is not to think long and hard about you and the words you want use, but rather, to pay attention to your ideal customers and the words they themselves are already using. That point about “the words they’re already using” is massive. 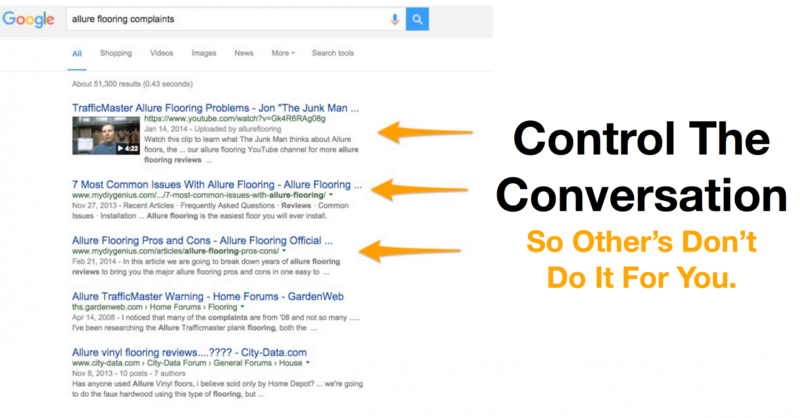 Conversation marketing aims at generating organic traffic not paid traffic. This means you have to organize your approach around specific keywords that are optimized to improve your search engine rankings for phrases your prospects are actually searching online. Conversations they’re starting. The search phrases that drive more traffic to your website — and are easiest to rank for (i.e. less competition) — are the ones that are more specific. 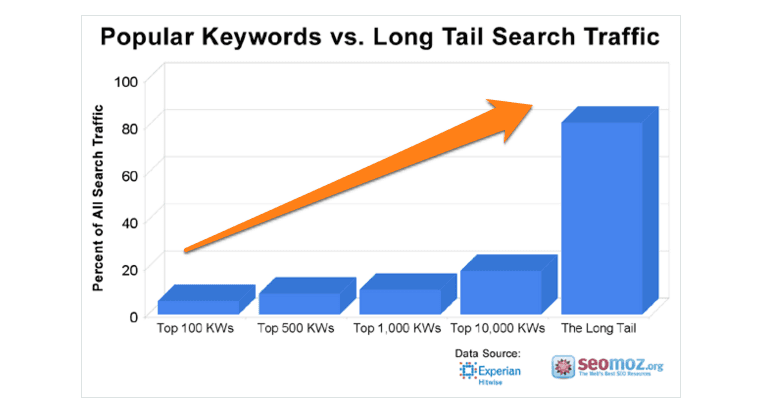 These are called “long-tail keywords” because they contain more than one or two words. Our own SEO Keyword Bible for Real Estate Investors can guide you step by step through this entire process. Ubersuggest is another fantastic tool you can also try to spark off ideas for long-tail keyword phrases. Now that you’re armed with the best keyword phrases that your target audience are already using to find solutions to their real estate needs, you’re ready for the next step: creating amazing content around the keyword phrase of your choice. However, simply having amazing content isn’t enough. You also have to ensure that content works on a technical front. This is even more important today because search engines now judge the value of a site based on its design as well as its speed. My suggestion is that you look for a designer or a proven website system like Carrot who is familiar with websites that perform well in the real-estate industry specifically. This option may be slightly more expensive than the “get a website for $90” deals, but will save you from going to the trouble of setting up a website — content and all — only to discover months later that technical issues are holding you back from bringing in traffic. Once you’ve created a base of content to address the first three stages of the buying cycle do not simply let it sit there. Repurposing your existing content is hands down the best way to create new content … without having to create new content. As soon as a particular piece of content (like an article) show signs of performing well — i.e., generating traffic or even things as simple as comments or social shares — turn that article into a video or a SlideShare presentation. Make it the topic of a video. Pick one specific point in the article to expand on it in an entirely new post. Or even bundle together your best articles into an ebook on a landing page. The truth is you can create untold variations of a single idea. Content Marketing Institute’s How to Turn 1 Idea Into 2 Months of Content Marketing (and More) and Buffer’s The Ultimate Guide to Repurposing Content: 12 Ways to Extend the Life of Every Article You Write offer exceptionally practical and creative way to do this. After you’ve created and repurposed your content, don’t make the mistake of thinking your conversations will take care of themselves. Our third and final phase is the real key. Evangelism is the last phase of the conversation marketing model you’ll need to lock down. 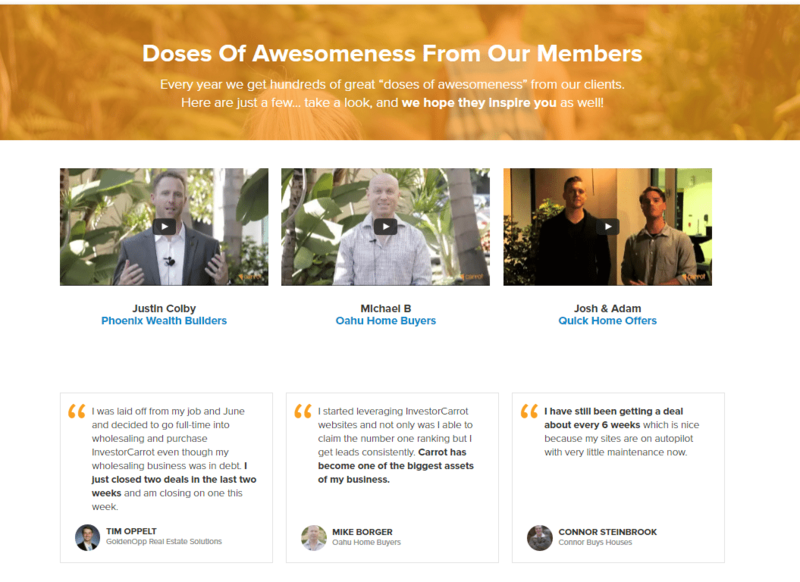 Simply put: creating evangelists means turning your best clients into your best salespeople. This involves being intentional not just about sharing your content directly with your best customers — in the hopes that they’ll go forth and do likewise — but including them in that content itself. For instance, if you spend any time at all on our website, you’ll notice there’s hardly a single page that doesn’t include a customer testimonial or case study. 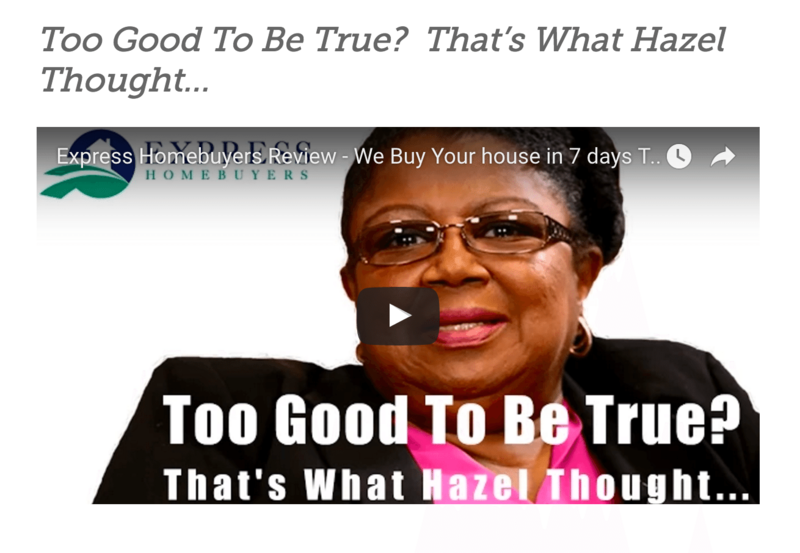 See how this top investor uses one of his client stories to squash the “too good to be true” thoughts going through some sellers minds. It empowers your clients to be evangelists for your brand and your company. Here’s what happens when you help your clients spread the word about your company and service. They do the selling for you! Why all this focus on our customers? Because we know the cold, hard truth: selling yourself is hard. Letting the people who’re already wildly delighted with your service sell you … is easy. Ironically, selling yourself means engaging in the very marketing behaviors that inhibit genuine conversations. Letting the people who’re already on your side sell you, that’s how you start a genuine conversation. Video is the most powerful form of evangelistic content, so make a real effort to get your content — especially repurposed content — into video format. If creating video content sounds daunting, it shouldn’t. And you know why they work? Because the format of those stories grows directly out of our overall approach itself: conversations not selling. You can do the exact same thing as a real estate investor or agent. Most entrepreneurs and small business leaders are overwhelmed by online marketing tactics meant to increase traffic. Because there are so many opinions, so many tools, and so many methods. On top of that, your prospects are equally overwhelmed. They’ve been exposed to scammers and self-centered agents alike, both of which make it clear that they’re only interested in one thing: making a quick buck. Conversation marketing won’t make you an overnight internet celebrity. It takes investment, insight, patentice, and a bit of creativity. But by following our proven three-phase method … you can dramatically increase your traffic without having to pay for it. Remember, of the over 200,000 leads our clients generated last year, less than 20% came from paid traffic… the majority of them came from Conversation Marketing. Best of all, you’ll position yourself as a genuinely helpful resource and the expert in your area which makes it so you’re not a commodity anymore. After all, people are people and every great relationship — business or otherwise — always starts with a conversation. Golden article, Trevor (and not because I’m in it!). So much content here but all straight up valuable and legit. With more and more people entering into the industry, controlling your brand name and reputation and positioning yourself as the local leader become increasingly important. Keep it up!